Originally built in 1924 and costing more than $3.5 million, the Sofitel Grand Sopot was completed and designed by Otto Kloeppel in 1927 and was known as the Kasino Hotel. 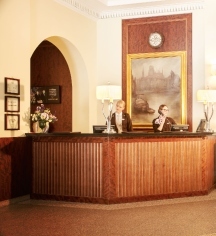 The construction of this grand hotel marked a new era in the history of Sopot. Located on the Baltic Sea, Sopot was and still is a relaxing escape, famous for its sandy beaches, spa tradition, and picturesque streets. The hotel’s opulent Art Deco design and adjacent casino attracted many elite tourists of Europe. Just after its completion, the hotel became a popular destination for millionaires who came to gamble, many of whom are rumored to have lost their fortunes here. Once such rumor is that of the town’s mayor, Dr. Eric Laue, who helped to finance the Kasino Hotel. This well-known local politician promoted the development of Sopot’s historic buildings and landmarks, including the Sopot Pier, the Forest Opera, and the city’s Resort House. Despite World War II and the destruction of much of the hotel’s adjoining buildings during this time, the hotel managed to survive. After the war’s end, the hotel was soon up and running again, under the name the Grand Hotel. It passed through several owners including the Gdynia-America Shipping Company, the Polish Ocean Lines Group, and finally the state-owned hotel operator Orbis. The hotel continued to welcome international guests and was a choice hotel for politicians during the Cold War. With the start of the Sopot Music Festival in the 1960s, the hotel became well known by international stars who performed at the festival. Once again, the Grand Hotel assumed its place as one of the notable hotels in Poland, despite being in need of restoration. In 1990, a new casino was created, and the hotel was acquired by the AccorHotels Group. After the acquisition, the hotel was closed and completely modernized, re-opening in 2006 under the Sofitel brand as the Sofitel Grand Sopot. 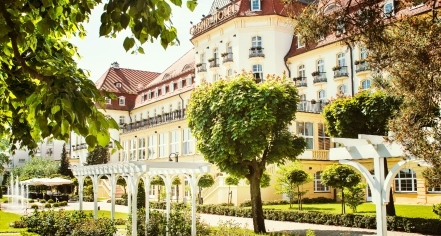 Sofitel Grand Sopot, a member of Historic Hotels Worldwide since 2018, dates back to 1927.